Rich green chypres, rustling bitter greens, earthy moss- these are perfume notes that have been going the way of the dodo in the last decade. The majority of casual perfume shoppers probably never noticed. After all, chypres went out of style even before IFRA decided we cannot read labels. The rest of us have been hoarding vintage Vent Vert and shopping with artisan and indie perfumers to get our moss fix. Moss Gown by perfumer Charna Ethier of Providence Perfume Company takes us to magical green lands. Green and earthy notes can be damp and chilly, like the mushroomy forest floor after the rain. But not here. Green Moss has some surprisingly dry and crunchy notes that were warmed by the sun for days. As a matter of fact I could swear I smell tagetes right behind the lively camomile, which is why on my mental perfume shelf I put Providence's Moss Gown right next to the wonderful Niki de Saint Phalle. That's high praise, I know, and I mean every word. The way Ms. Ethier composed and placed the velvety and dark mossy notes against the warmth of sunny Provençal fields is marvelous. There's some bitterness in Moss Gown, and I love it plays out on my skin. As the fragrance develops, it's sweetened a little, and reminds me of a homemade herbal tea. The freshly brewed pot stands on the table next to a small vase of yellow wildflowers (there are no allergies in my little fantasy). The dry-down is woody and mossy, smooth and quite dry. If I spray enough, it lasts for about 6 hours. If I spray on my clothes, it's still there the next day. 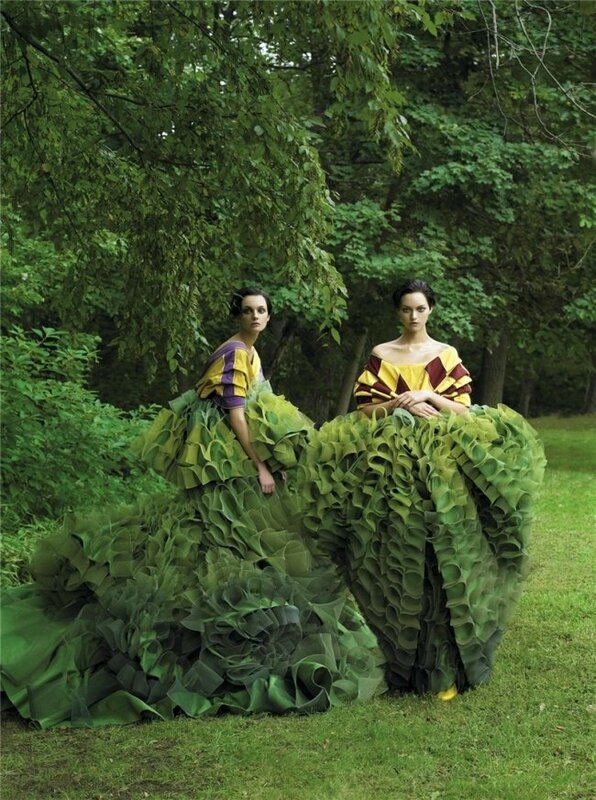 I'd say that Moss Gown is a must-sample to those who miss the green and chypre perfumes of yore. And for those who dream about rolling down a very green hill on a sunny day, and reach the bottom laughing and full of joy. Moss Gown by Providence Perfume Company ($36, 6ml travel spray; other sizes and samples available) can be purchased from BeautyHabit.com as well as directly from providenceperfume.com. The sample for this review was supplied by the perfumer. Image: Galliano for Dior, photographed by Steven Meisel. Hi Gaia, I love the visualizations here, both written and of the billowing foliage like dresses in the image! Hmmmmm I wonder if I would like this scent in my mossy green environment? I have been going for contrast like I did in LA where this would have been perfect for me! Sounds just like what I have loved in my teeny sample of vintage Vent Vert, you know! Hope you are OK out there on the East Coast!!! Thank you Gaia for your incredibly lovely review of my Moss Gown perfume! Niki de Saint Phalle is one of my all time favorites, and I'm bowled over by the comparison. I hope power is restored to you soon and I'm happy to hear that you and yours are safe! I ran right over here from my Reader feed to see if anyone mentioned the 'Moss Gown' the semi-modern fairytale. It used to be one of my favorite stories when I was a kid! From the description of the perfume, it sounds like the perfume does a good job of channeling the spirit of the story (a sweet variation on Cinderella) whether it's inspired by it or not.